REDONDO BEACH — A revitalization project designed to bring the community back to the Redondo Beach waterfront will also bring something that has long been requested by local boaters: A public boat launch ramp. The ramp would replace a hoist that has long-served vessels in the harbor. Boat owners, harbor visitors and local residents seemed to be in agreement with CenterCal Properties plan to include a boat ramp in the upcoming waterfront redevelopment project, during the city of Redondo Beach’s Waterfront Revitalization community workshop Feb. 23. 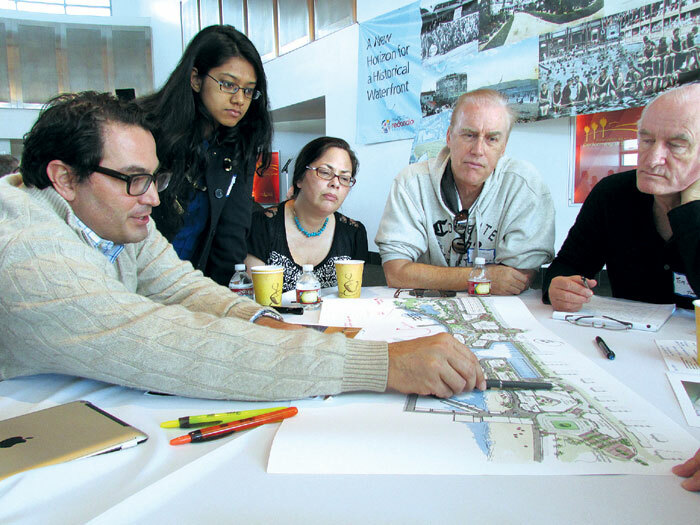 Held from 10 a.m. to noon at the Redondo Beach Performing Arts Center, the meeting was a forum for the public to provide their input and review the proposed changes to the waterfront. Bruning’s announcement that the company plans to place the launch ramp where the Joe’s Crab Shack restaurant currently sits was good news to boaters at the meeting. The panel was against placing the ramp at the hoist’s current spot in Redondo Beach Marina, due to up winds, wind shadows and narrowness of the area. CalCenter representatives are in discussion with Joe’s Crab Shack to relocate the restaurant and construct the ramp at the restaurant’s current location. In addition to the boat ramp, the project would bring a boutique hotel, a 600- to 800-seat theater, a market similar to Pike’s Place market in Seattle and a mix of restaurants to the waterfront. Bruning also recommended repurposing Seaside Lagoon as a natural estuary, as a way to create a more environmentally friendly body of water. The saltwater swimming lagoon is designed to chlorinate seawater for swimming and dechlorinate it as it is released back into the ocean. During its journey from the ocean to the lagoon and back again, the water is also circulated through the AES power plant, to cool its turbines. The repurposed Seaside Lagoon estuary plan would provide more direct access to the ocean for small boaters, which was important to many of those at the meeting. Opening up the site would allow kayakers and standup paddleboarders an area to launch directly into the ocean freeing up the dinghy dock located near the lagoon that was intended for transient boaters, Hansen said. “One of the concerns is that we don’t have enough space to accommodate both, and this would free up the dinghy dock,” he said. King Harbor YC Commodore Lisa Falk shared her opinions on specific project elements at her table, where the group voiced concerns over building heights and obstructed views. She also asked if the proposed bridge would provide enough clearance for sailboats. “I’m very pleasantly surprised (with the concept plant): They really listened to us,” she said. “We are going to have to share the water and learn to work cooperatively, if that’s where the launch ramp is placed — but everyone will have to adjust and be very careful. “It’s not a huge harbor, but it’s great harbor,” Falk added. Representatives of CenterCal will bring an updated plan to the city council — and several public meetings will be held between April and June. The project will be divided into three phases and will include improvements to boating facilities, streetscapes and parks. Plans include renovation of the pier, the landing’s façade and the creation of a new hotel. For more information, visit redondobeachwaterfront.org.